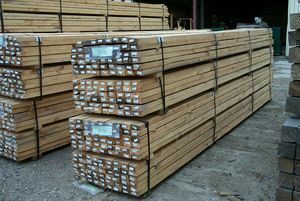 Rougher Header, or Laser Cut as it is sometimes known, is timber that has been dressed on all sides and has a smooth surface. The timber has been kiln dried after treatment which means it will incur minimal shrinkage. It can be machined to an exact size within millimetres. It has the advantages of less chance of splinters, easier to coat with paint etc..., and a more finished look over rough sawn timber. Often used for building pergolas, outdoor areas and furniture rougher header can also be more precisely sized as it is machined. Sizes below can be machined down to a specific size, and can also be treated to a higher Hazard Level if required. Rougher Header CCA, H3 hazard level as standard suitable for all exterior above ground use. Standard lengths for the above sizes include: 6.0, 5.4, 4.8, 4.2 & 3.6m.